Chai Ki brings a splash of colour to the endless walls grey and glass in Canary Wharf with its delicious menu of authentic Indian food! Rohit Chugh, founder of the excellent Roti Chai by Oxford Street. 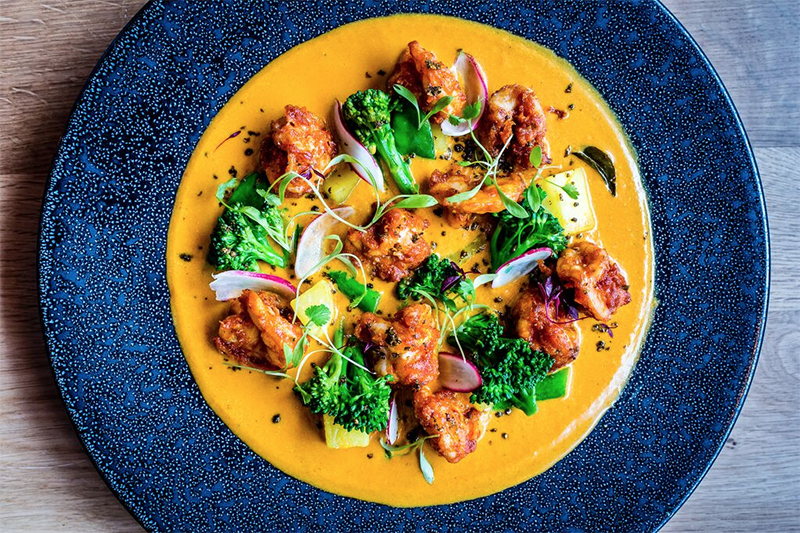 Located alongside its Indian streetfood inspired sister restaurant, Toddy Shop, Chai Ki offers a seriously tempting menu of hearty home-style dishes. Must try dishes include some gently spiced and grilled Paneer with an incredible Indo-chinese style dipping sauce; an unapologetically rich and hearty Lamb shoulder curry; and best of all, the Crispy aromatic prawns swimming in a shallow pool of the most delicious coconut sauce imaginable; it's was so moreish, we ordered an extra nan just to soak up the sauce! Even desserts were impressive, included a feather-light cheesecake. Smaller plates cost around £7 whilst the generous mains will set you back around £16. Cocktails are also inspired by the spice and coconut-studded coastlines, with signatures including the Chai and Orange Martini; Mango Caipirinha; and the Pineapple Gin-Ji. The Vibe…/ The stripped back, industrial design of the venue creates a relaxed venue in which to enjoy a few nibbles and a drink or a blowout meal. Cos after 50 years of curry houses, authentic Indian food is now taking over. Dishes like the Coconut prawns are worthy of a trip on their own! Oh, and after the plethora of recent high-profile restaurant openings, Canary Wharf and it's surrounding area finally gets a proper Indian restaurant.